One day, in 1999, my then 14 year old son came home from school and told me his friend’s dog had had puppies and I simply HAD to see them…..they were too cute. My daughter, 16 at the time, had been pestering us to get a dog for as long as I could remember. We had tried to placate her with numerous hamsters, rats and even cats but she still wanted a dog with all her heart. At that time, I was off work recovering from breast cancer and I was expected to be off for several months. My husband and I discussed it and decided that, between us all, we could be there for a puppy more or less every minute of the day, even when I returned to work. He worked odd hours, often not starting until afternoon and then working evenings, I worked part time, so I was home early and both children came home from school in the afternoon so we figured we could work it out. We decided not to tell my daughter so, when the puppies were ready to go, my son and I went to pick up Oscar, a strange looking little terrier, a mix of pure white Staffie and a cross Jack Russell/Yorkshire terrier. 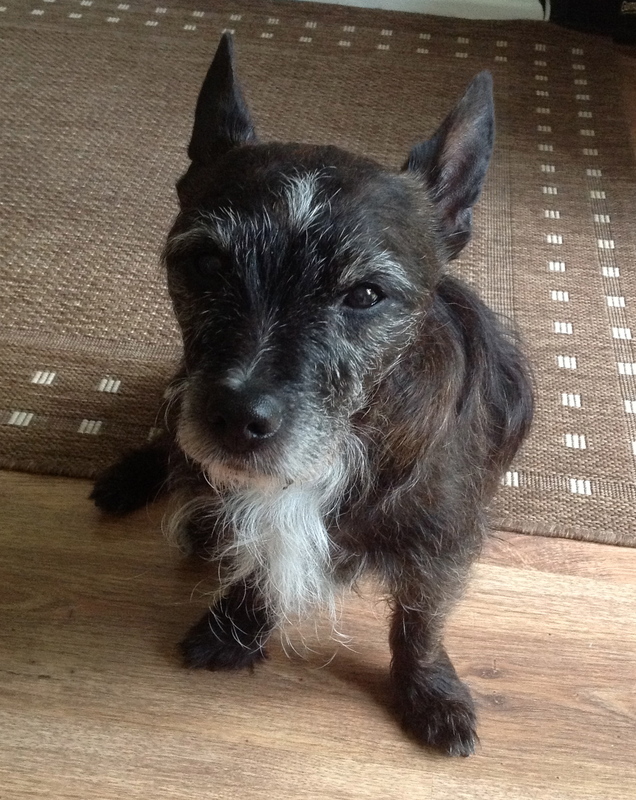 A little hairy staffie with big ears…. We put Oscar in a box and I asked my daughter to hold the box when I got in, saying I had something in my shoe. She seemed confused but took the box. At that point, Oscar popped out. Her face was a picture. A mixture of puzzlement, surprise and pure disbelief. She didn’t believe me when I said he was ours……there were tears of joy when she realised he was! Oscar initially became my dog, since I was the one at home all the time and I house-trained him and generally taught him the rules. He was to become everyone’s dog of course but I was his mummy at that time and he was a very good little boy. All the while I was recovering from breast surgery and the subsequent radiotherapy, my little puppy was there, wagging his tail and being adorable. Oscar grew, my children grew, we all got on with our lives……he was a funny little dog, full of character and everyone loved him. He had a feisty streak too and a particular ‘attitude’ towards big dogs! My husband called him an ‘Essex Terrier’ as Oscar thought he was as tough as all the big dogs. Oscar was there whenever one of us was upset, wagging his tail or simply lying down with us. He comforted me when I lost my beloved dad and saw us all through many family ups and downs. In 2004 my husband passed away after a short battle with cancer. Yet again, Oscar was our little tower of strength, comforting us all and staying with his dad through his illness. He knew there was something very wrong but he carried on being Oscar and making us smile, even when there didn’t seem as if there was anything to smile about. Since then, I’m happy to say, life has been a little less stressful and Oscar found a new dad when KD came to live with me five years ago. As Oscar grew older, KD looked after him, taking him for walks, talking to him and generally being a wonderful dad to my beloved dog. He became KD’s dog too and the two of them were inseperable. Oscar started to become ill earlier this year and we had to go back and forth to the vet’s with him. Everyone in the vet knew him well and always loved it when he had an overnight stay. They all said what a darling little dog he was, such a character. We knew he was not getting any younger. Oscar started to have problems breathing. We knew things had got much worse but we had a holiday booked and didn’t know what we would do. He needed a lot of care by now. My son changed his work rota around and stayed with him so we could still go. He barely left the house and made sure Oscar had his tablets, as well as feeding him fillet steak and sausages because, by now, Oscar wasn’t eating properly. He was not a well dog but he enjoyed the week with my son. His little tail wagged and he tried to follow him around the house, although his breathing didn’t always let him. The day after we returned from Italy we made the very difficult decision to put Oscar out of his pain. We knew he would only get worse and he was struggling more and more each day. It was the most difficult decision I have ever made. He was still wagging his tail and making an effort to follow us around but, in his eyes, he was saying, ‘please help me mummy’. On Friday 14th June, we took Oscar to the vet and we said goodbye to him. We stayed with him while they put him to sleep and I cuddled him as he left this world. 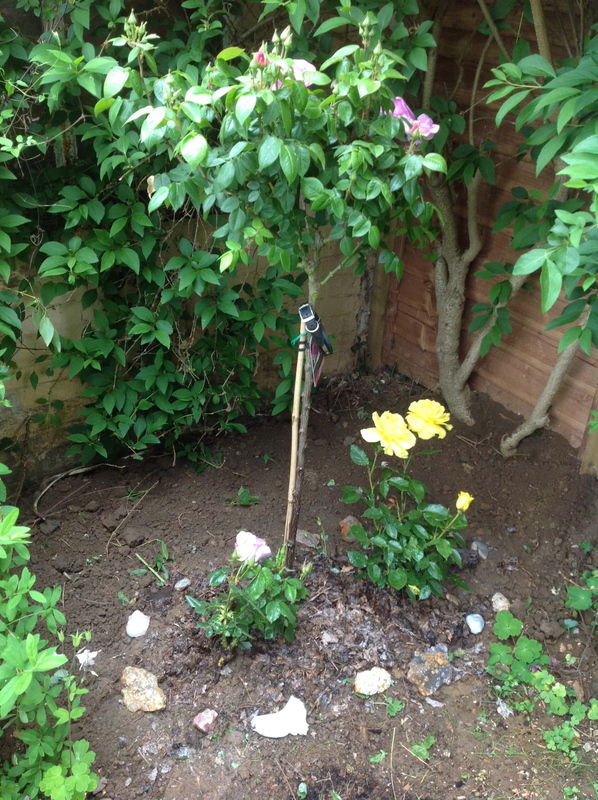 We brought him home the next morning and buried him in our garden, with some beautiful rose bushes to mark the spot. It is Oscar’s memorial garden. The pain of losing your dog is indescribable. If you are not a dog lover/owner you probably wouldn’t understand but anyone who is will know exactly how we feel. There is a huge empty space in our lives now. No more ‘tap tap’ of his claws on the stone floor, no snoring in the night, no waggy tail, no little friend. But the pain of losing Oscar was worth going through for the 14 years of absolute joy we had with him.